This week’s Six on Saturday garden photos are a glimpse into my backyard garden in early February. 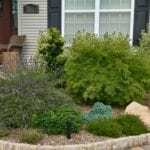 There’s some nice evergreen shrub colors, but there’s also some work I need to do. Just keeping it real! 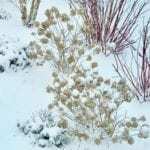 You’ll see his six chosen photos, and in the comments section of his blog post you’ll see lots of gardeners — from all over the world — sharing our own links to our chosen photos for the week. If you love to garden, it’s definitely worth looking at everyone’s photos! 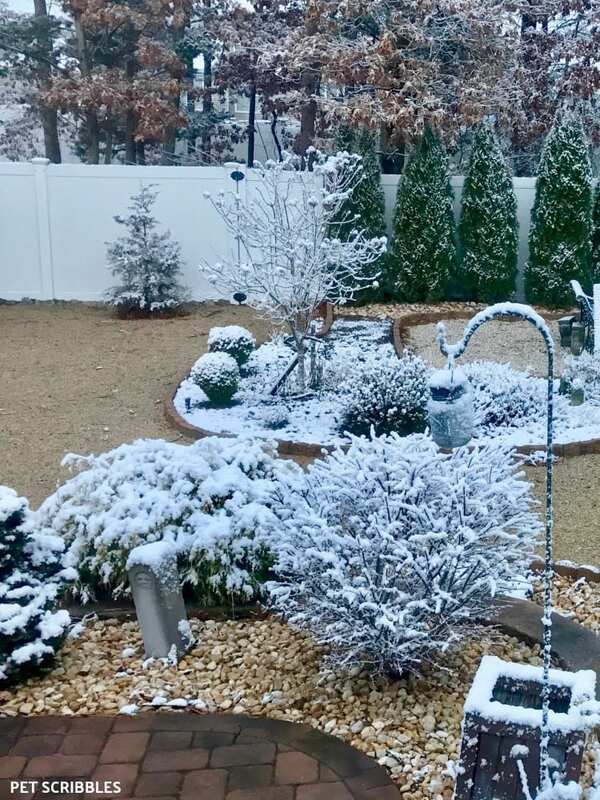 But here is reality, and this is how the main garden in the backyard looks today. 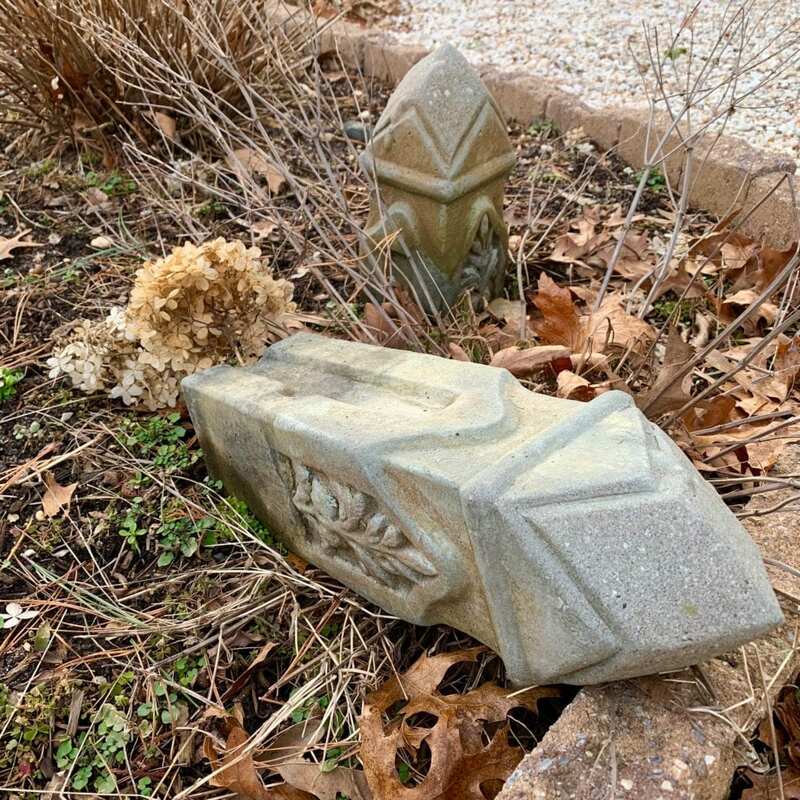 I can’t even bother to pick up the knocked over finial. Somehow I think it needs to stay that way, giving the dried hydrangea flower a place to lean. 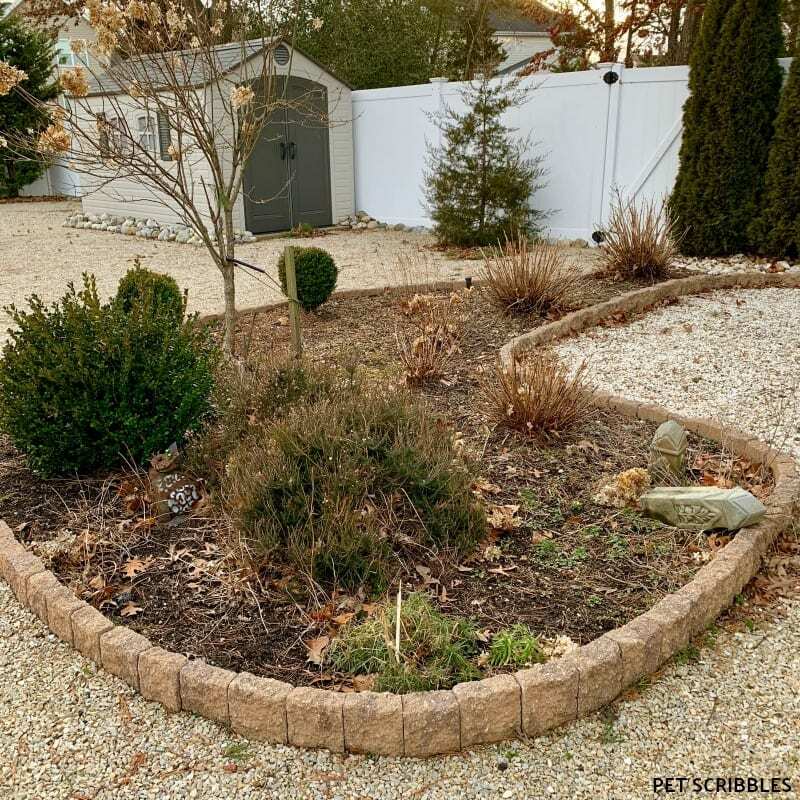 Up close, there is a bit of color in this garden, with the Winter gem boxwood and the scraggly Heather. 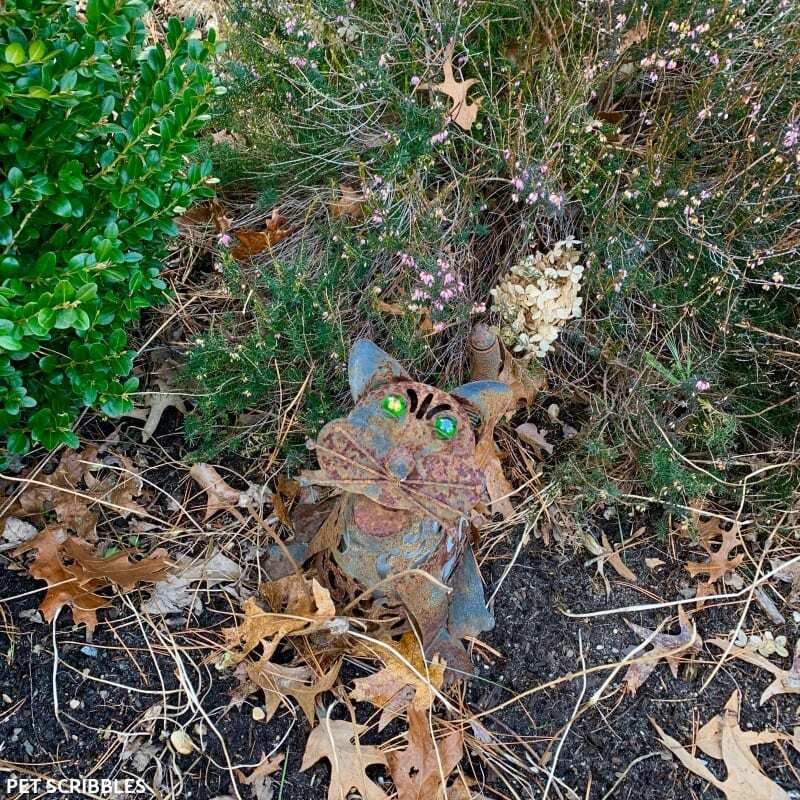 And of course, the rusty cat. This garden is going to be a major project this coming Spring and Summer. I really let it go last year, other than transplanting some hydrangea shrubs from the front yard into this area. 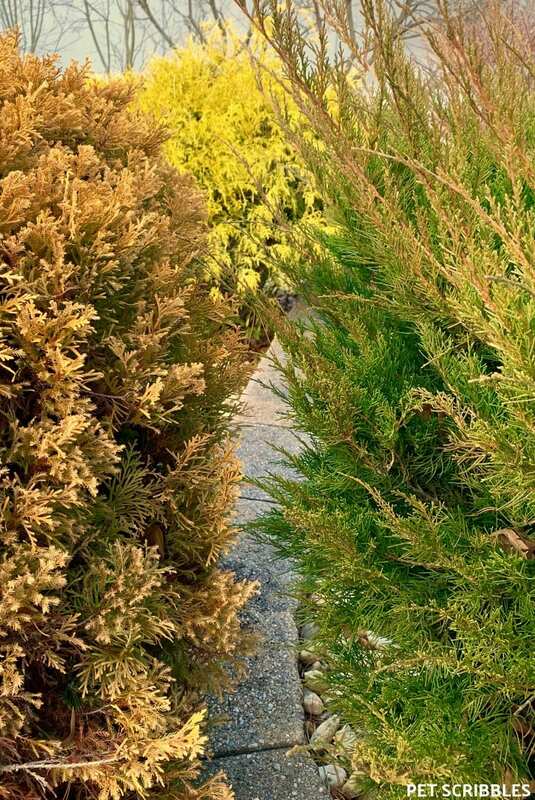 The real delight is around our patio, with colorful evergreen shrubs! 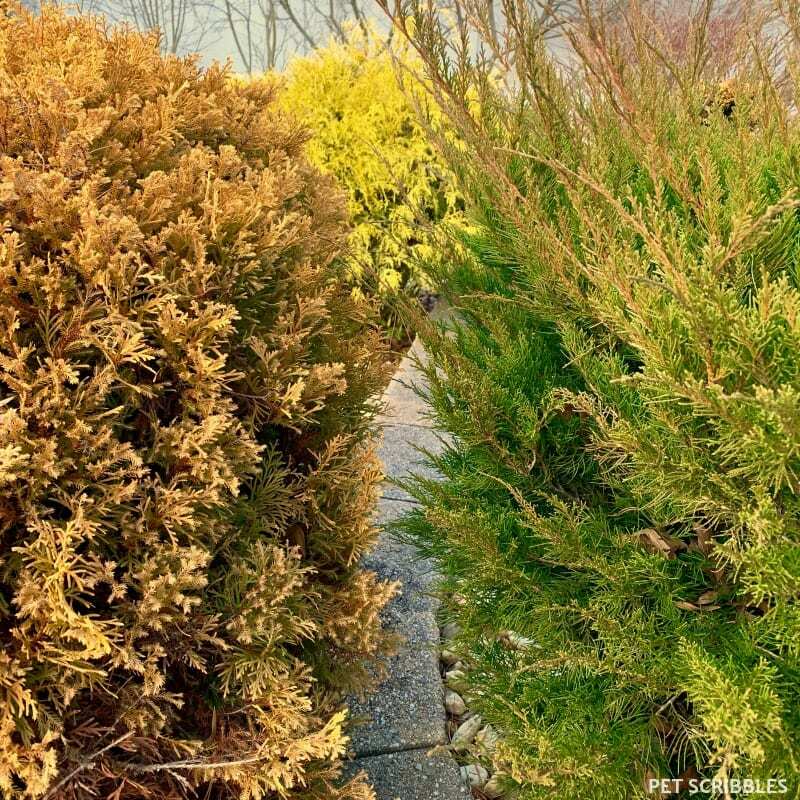 Left to right: Rheingold Arborvitae, King’s Gold Cypress (in the back) and Shore Juniper. If you’re not familiar with the Rheingold — the color change between Winter and Summer is wonderful! 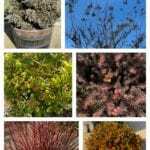 In the Winter you get a beautiful copper color, and in the Summer the shrub is bright green. I’m envious of my friends in Europe who are enjoying Spring bulbs and some early-blooming flowers right now. But I’m also mindful that I do enjoy the Winter too, so I just need to be patient. I also need to stop staring at the ground willing those Spring bulbs to start popping up! Hah! 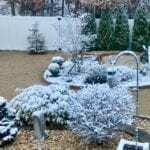 I loved your pictures of snow deposited as icing sugar on the shrubs. Nice Six ! Thanks Fred! Glad you liked the icing sugar pictures! The scene was quite magical! 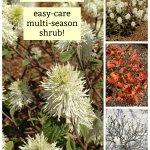 That’s funny Mala, and I’d love to have blooming Forsythia this early! I once saw tons of blooming Forsythia in Germany in early February when attending a family funeral. It had been super warm there, but that morning it snowed. To be outside with snow falling and the yellow blooms around us was quite the scene. It’s nice to come across a bit of love for conifers for a change; they’ve fallen deeply out of favour in the UK and Rheingold, which was one of the most popular, is something you don’t often see. Your cold winters will make them produce much more intense colours than they usually do here. That’s interesting they fell out of favor in the UK. 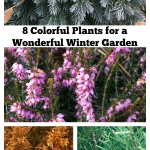 I rely on conifers for Winter color because we’re too cold (at least where I’m located) for much of anything blooming except my Heather/Heath. In the Summer I just want the conifers to survive our heat and humidity! That’s about all the snow I ever like to see! The kind that makes everything frosted and glittery! You’re not the first person to feel that way! I wish it could stay looking that way all Winter! Especially on the gardens where it looks drab otherwise! 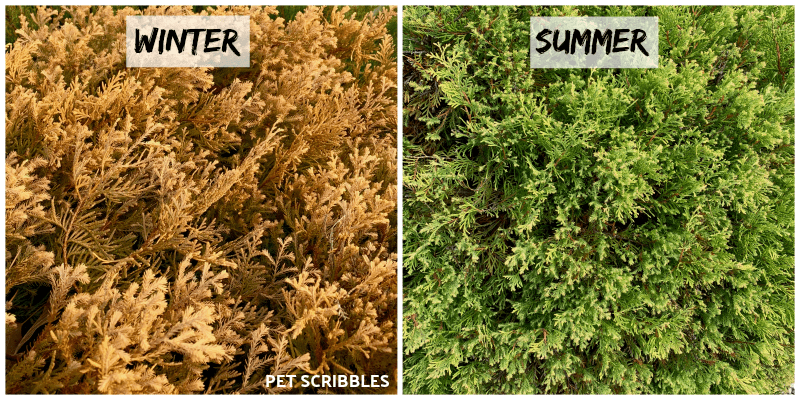 I had no idea a conifer could vary in colour so much from winter to summer. So much for evergreens! Fantastic. Thanks Sarah! We could all use a little magic, I suppose! I love that you are staring at the ground willing the bulbs to appear! There always appears to be nothing for the longest time and then one day you wake up and there are flowers! Nature is pretty amazing!! Stare harder! You just don’t want it enough! Maybe if you get some friends round and all stare in unison?